For many commercial real estate investors, the current economic outlook can pose challenges. As the Fed raises interest rates, existing commercial real estate investors may be adversely affected when it comes time to refinance. The rising rate environment could make it more difficult for those with highly leveraged properties to obtain financing, so planning farther ahead is a good idea. As interest rates rise, the DSCR (debt service coverage ratio) goes down. This makes it more difficult to borrow, as higher rates make it more challenging for banks and other lenders to justify lending money for real estate projects. To demonstrate this, look no further than the CRE investors who have been rushing to get their loans refinanced over the last year — data shows rising total loans and interest rates. Keep in mind, rising interest rates could also lead to an increase in cap rates. Such an increase could lead to lower valuations and a decreased ability to borrow. Furthermore, a rise in rates can contribute to an increase in the cost of loans. After historical lows, rates are likely to keep rising. Many CRE investors are taking action now. In addition to rising rates, another perhaps bigger risk is a recession. A flattening yield curve, which indicates that short-term rates are rising faster than long-term rates, suggests that the market thinks economic growth and inflation are not sustainable in the long-term and could drop in the near future. This pattern could also lead to an inverted yield curve, which has historically indicated an impending economic downturn. If a recession happens, CRE investors may be hit hard, and credit could dry up. For investors who have debt coming due at a time of a recession, refinancing could be harder to secure. Refinancing now can help investors avoid these problems and limit an investor’s exposure. One suggestion for landlords to hedge against tenant renewal issues down the road for those in a softening market is to renegotiate rents now — and perhaps boost rents in a slow-growing-rate environment. If you’re getting sufficient cash flow, the current trends in the market might not affect you as much. But if you have highly leveraged properties, it’s time to revisit your long-term investment plan. On the refinancing side, landlords using debt capital to finance acquisitions or portfolios should make sure they do not have a balloon payment during a downturn, when cashflow or the ability to service the debt is uncertain. We can’t say whether short-term or long-term rates will rise, but owners should think about converting short-term debt into long-term debt — something banks typically don’t provide. Converting to long-term debt is a step that can help reduce uncertainty around the profits in a project and let investors rest easy. The rate environment and economy are unpredictable. However, there are steps you can take to make good investment decisions as a property investor — especially with a lender who can offer a full range of lending options. The information provided here is for general informational purposes only and should not be considered an individualized recommendation or personalized investment advice. All expressions of opinion are subject to change without notice in reaction to shifting market conditions. Ownership of real estate contains unique risks, such as changes in real estate values and property taxes, interest rates, cash flow of underlying real estate assets, supply and demand, and the management skill and credit worthiness of the issuer. Diversification and asset allocation strategies do not ensure a profit and cannot protect against losses in a declining market. This article is not intended to replace competent legal, tax, investment or financial planning advice. Each investor needs to review an investment strategy for his or her own particular situation before making any investment decision. Please contact your investment, tax and legal advisors for professional advice that is consistent with your personal situation. Examples provided are for illustrative purposes only and not intended to be reflective of results you can expect to achieve. Historical performance is not a reliable indicator of current or future performance. Mike Trehey is PLUM’s midwest Executive Vice President. Learn more about midwest CRE trends. 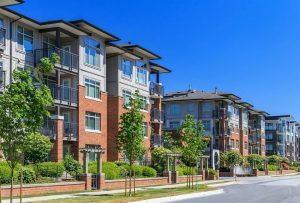 Fannie Mae Multifamily Green Financing provides mortgage financing for multifamily properties, such as apartments and cooperatives. Where Does Commercial Real Estate Fit in an Investment Portfolio? Commercial real estate (CRE) may offer owners a powerful way to protect and grow their wealth. Financial technology (FinTech) is continuing its exponential expansion through 2017, and is now transforming the world of commercial real estate (CRE) lending, an industry previously slow to adapt to technological advancement, through data.